While the Holy Mother of the Rosary Cathedral was originally located down the street from St. Adalbert’s Basilica, in death the two parishes are even closer together. On Dale Road in the town of Cheektowaga The Holy Mother of the Rosary Cemetery is flanked on both sides by the Basilica’s cemetery. The third oldest Polish cemetery in the region, the Holy Mother Cemetery was purchased in September of 1896 from the Ney family for $6,000. The cemetery became a central hub of for the independent Polish parishes in the region, after they all affiliated with the Polish National Catholic Church based in Scranton, PA. Soon, the Holy Mother of the Rosary Cemetery was home for the deceased parishioners of All Saints Church in Black Rock, Holy Trinity in Lackawanna, and St. Joseph’s in Depew. In addition to many of the pioneers of Buffalo’s Polish National Catholic, the cemetery is the final resting place Bishop Stefan Kaminski and Buffalo-Pittsburgh Diocese’s Bishop Jan Jasinski. The cemetery also has the distinction of holding one of the prime bishops of the Polish National Catholic Church, Tadeusz Zielinski. Zielinski, a well-respected figure in Buffalo’s Polonia was elected bishop of the Buffalo-Pittsburgh Diocese in 1953. He would serve in this role for 16 years, during which time he was elected as successor to Prime Bishop Leon Grochowski, should anything happen to him. With the passing of Grochowski on July 17, 1969, Tadeusz Zielinski became the third prime bishop of the Polish National Catholic Church. As well as the important religious members of the Polish National Catholic Church, Holy Mother of the Rosary holds leading figure of early Polonia and founding father of the Polish National Alliance, Julian Lipinski (Lipinscy). A veteran of the January Uprising of 1863 living in Philadelphia, PA, Lipinski along with Julian Andrzejkowicz organized a meeting on February 15, 1880. At this meeting, a mission to create a national federation for all the Polish organizations of Polonia that would craft policies for the betterment of Polish America emerged. Andrzejkowicz proposed they call their new federation Zwiazek Narodowy Polski, or the Polish National Alliance. They held their first elections with Julius Andrzejkowicz being elected president of the alliance, John Szoner as vice president, Julian Szajnert as secretary, and Lipinski as treasurer. Within nine months, 20 societies from across the country had joined and on August 10, 1880 a now nationally elected president Andrzejkowicz called for a constitutional convention, marking the official birth of the Polish National Alliance. Julian would be active in the PNA during its early rise despite his age. He attended five of the PNA sejms, and would be the chairman of the 1897 National Convention held in Buffalo, where he had been living in retirement. At that convention Lipinski was voted an honorary lifetime member of the alliance. In 1898, Julian passed away and was interred in a modest grave near the rear of the cemetery. 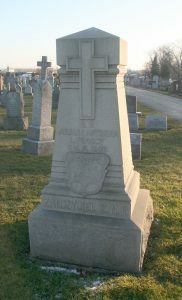 Due to his importance of one of the largest Polish American organizations, the Polish National Alliance had Lipinski’s grave moved to a more prominent location and commissioned a fitting monument for their founder. On May 30, 1915, the monument bearing the seal of the Polish National Alliance was unveiled following a parade and formal ceremony. 1895 Pamietnik Jubileuszowy 40-ej Rocznicy Powstania Polcko Narodowej Katolickiej Katedry Matki Boskiej Rozancowej W Buffalo, N. Y. 1935. Buffalo, NY: Druk Dziennika Dla Wszystkich, 1935. Print. 1895 Pamietnik 45-cio Letniego Jubileuszu Katedry Matki Boskiej Rozancowej W Buffalo, N. Y. 1940. Buffalo, NY: Druk Dziennika Dla Wszystkich, 1940. Print. Counsel for the Church. 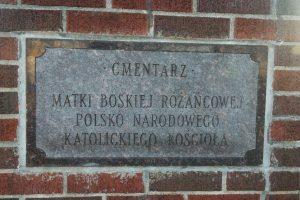 History of The Polish National Catholic Church of The Holy Mother of the Rosary Buffalo, New York. Buffalo, NY: Otto Ulbrich Co, 1945. Print. Drabik, Michael. "Holy Mother of the Rosary Polish National Cemetery." Searchers (Dec. 1990): 6-7. Print. Holy Mother of the Rosary Cathedral: 1895-1995, a Century of Service in the Lord. Orchard Park, NY: RW Publications, 1995. Print. Holy Mother of the Rosary Cathedral, Buffalo, N.Y., 1895-1970: 75th Anniversary. Buffalo, N.Y.? : Cathedral?, 1970. Print. Holy Mother of the Rosary Cathedral, Buffalo, New York: 90th Anniversary, 1895-1985. Buffalo, NY: Publisher Not Identified, 1985. Print. "Monument Stands As Poles' Tribute to Julian Lipinski." Buffalo Courier[Buffalo, NY] 21 May 1915: n. pag. Print. Pamietnik Srebrnego Jubileuszu Parafii Matki Boskiej Matki Boskiej Rozancowej W Buffalo, N.Y. Buffalo, NY: Dziennika Dla Wszystkich, 1920. Print. Pienkos, Donald E. PNA: A Centennial History of the Polish National Alliance of the United States of North America. Boulder: East European Monographs, 1984. Print. "Our Parish." Our Parish. Holy Mother Of The Rosary Cathedral, n.d. Web. 27 Dec. 2015. Pamiętnik Złotego Jubileuszu: Polsko-Narodowej Katolickiej Katedry Pod Wezwaniem Matki Boskiej Różańcowej W Buffalo, New York, 1895-1945. Buffalo, N.Y.: Everybody's, 1945. Print. Theodosetta, C. S. F. N., Sister M. "Poles_in_philadelphia." Poles In Philadelphia. Polish Roots, n.d. Web. 06 Jan. 2016.